From formals to holiday cocktail parties to New Year’s Eve, the end of the year is full of excuses to dress up! Why not (subtly) rock your sorority’s colors while you do it? Put on your pearls and your Panhel spirit while you rock one of these dresses this holiday season! 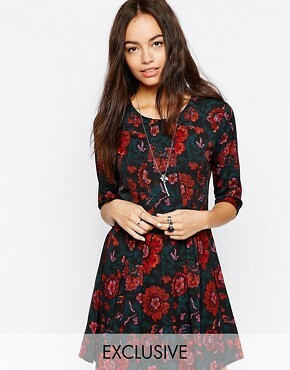 Fallen Star Fit & Flare Dress In Dark Floral Print, ASOS. Talk about the perfect sororities for holiday colors! While red and green can be a tough pair to work, the red flowers and dark green leaves on this dress are elegant, not gaudy. May I suggest sky high black pumps and red lips? Pleat Elite Fit-and-Flare Dress, Nasty Gal. Don a glamorous red dress if you’re in one of these lucky three sisterhoods! And don’t forget the red lipstick to match! Nasty Gal With the Bandage Dress, Nasty Gal. Whether you decide on a bright cobalt, a gorgeous azure, or a sophisticated navy, blue is sure to be a showstopper. Pro tip: Make your heels your other sorority’s other color. In Phi Sig or Alpha Xi Delta? Gold heels! Theta Phi Alpha or Tri Delt? Pick gold or silver! ASOS Dress in Bonded Crepe with Asymmetric Hem, ASOS. Festive but unexpected, a bright green dress is perfect for KDs, AEPhis, and ASTs! Add shiny gold heels if you’re an AST, or matte white accessories if you’re a KD or AEPhi. Dress the Population Mia Black and Gold Sequin Dress, Lulu’s. All that glitters is gold! Party-perfect, this sparkly black and gold number is an A+ option for everything from formals to NYE parties. Add some patent leather black heels and call it a night! Sweepstakes Winner Magenta Skater Dress, Lulu’s. Hey Pink Ladies! Take a girly staple like a pink dress and accessorize with your sorority’s other colors! GPhiB? Chocolate brown heels. DZ? Forest green necklace. DG? Blue or bronze pumps. And if you’re Phi Mu? More pink, please! River Island Pencil Dress, ASOS. Unique and bold, you’ll definitely be the only girl in purple! Keep your make up simple to balance out this bold look. If you’re a Tri Sig, a matte white statement necklace would look gorgeous. Wyldr Chaser Burgundy Lace Dress, Lulu’s. Red’s sultrier sister, wine or bordeaux makes for a gorgeous holiday dress. Keep it classic with silver or black pumps! Pleats on Earth Turquoise Dress, Lulu’s. Last but not least, a color fit for a queen! Dress up the bright color with sparkly jewels, and, of course, silver heels.